July 11, 2011 -- When faced with interproximal root caries, what is the best way to fill them? 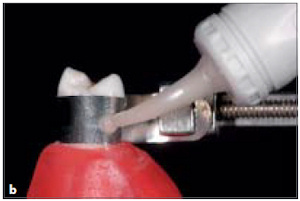 While many would drill up or down through the crown to reach the lesion, two prosthodontists from Israel are confident that they've come up with a better, less invasive method for treating them (Quintessence International, July/August 2011, Vol. 42:7, pp. 611-614). First, remove all caries using a slot preparation with access from the buccal or lingual surface. Next, prepare a matrix band by cutting a 3-mm diameter opening into it with a carbide bur; the prepared band is then tightly fit onto the tooth. Then inject the glass ionomer through the opening in the matrix (the authors used Fuji IX GP from GC America). Finally, remove the matrix and excess material, then finish and evaluate with radiographic imaging. With the matrix band tightly fit at the cervical margin, palatal/lingual access is allowed through an opening and glass ionomer injected into the preparation. Image courtesy of Quintessence International. "The beauty of the method is that even teeth that may otherwise have a guarded prognosis can be treated and kept in the mouth for a long time with very, very good results," said lead author Sorin Teich, DMD, MBA, an associate professor and director of clinical operations in the department of comprehensive care at Case Western Reserve University School of Dental Medicine. "This may add another modality for the general practitioner." The procedure modifies an amalgam-based approach created by the study's co-author, Ilan Gilboa, DMD, an instructor at Tel Aviv University school of dental medicine. "We did the switch from amalgam to glass ionomers specifically for the root caries that are interproximally placed," Dr. Teich explained. "With amalgam, you have to prepare a cavity that has retention, and this is not the situation here, necessarily. The glass ionomer adheres to the dentin, and you can have a more conservative preparation." In addition to longer survival rates in low-stress areas such as a class V restoration, better aesthetics, fluoride release, and anticariogenic properties of the glass ionomer, Dr. Teich and Dr. Gilboa noted another benefit during their follow-up effort: no secondary caries. That study, completed but unpublished, examines the long-time clinical survival of restorations placed with this method. "We had a few restorations that failed, of course, because there's no perfect restoration," Dr. Teich explained. "When they detached, we didn't find secondary caries beneath them -- that's a significant advantage, especially in a location that's so prone to them like the root." Root caries occur in 23.7% of those 65 and older, a demographic prone to gingival recession and exposed root surfaces, the study authors noted. As baby boomers get older, the number of patients needing treatment for interproximal root caries lesions could increase for many dentists. Consequently, Dr. Teich suggests that dentists consider using the glass ionomer method. "Try it once, try it twice, try to refine the method," he said. "It's not rocket science, but I think that we do provide an additional modality for the treatment of teeth that would otherwise have a guarded prognosis." The approach harkens back to Dr. Teich's residency days, when "we were really fighting for every single tooth because we had no alternative to that," he recalled. "Now we have implants." Nonetheless, implants are simply out of reach for many patients, and this method could provide a cost-effective treatment course outside of extraction and implants, Dr. Teich noted. "This type of method is providing a very good service for a lesion that is a little bit difficult to treat," he said. "And at the end of the day, the best implant is a tooth."